I hope Aimee and Jack can make it to the Galaxy S5 unveiling to relive this on-screen magic like only Jack and Aimee can. Please, Samsung, bring them. Please bring the single man’s guide to picking up women with a Galaxy Gear too. So, are you GEARed up? Haaaaaa. Samsung is no stranger when it comes to creating minor revisions of its tablet hardware, or even creating product bundles that bear their own special names. A few examples that come to mind include the Galaxy Tab 2 7.0 Student Edition, the Galaxy Tab 3 Kids and, if rumor proves correct, the company is even preparing a Galaxy Tab 3 7.0 Lite. Now it looks like we’re getting yet another special edition bundle, this time the Galaxy Tab 3 8.0 Game Edition. As you might have guessed, the new bundle includes a run-of-the-mill Galaxy Tab 3 8.0 bundled with Samsung’s new GamePad controller. Of course the Tab 3 itself is too big to hook up to the Gamepad’s smartphone attachment bracket, but the good news is that Samsung is including an HDMI adapter so you can hook the Tab 3 up to your TV and then use the controller across the room via Bluetooth. Basically its like a micro-console and Android tablet all in one convenient package. Unfortunately, the Tab 3 8.0 isn’t exactly a heavyweight champion when it comes to hardware, though it should still handle most games at least reasonably well. As a refresher, the device is powered by a dual-core 1.5GHz Exynos 4212 CPU with 1.5GB of RAM. Other specs include 16GB storage, a 5MP shooter, 1.3MP front cam, microSD, a 4450 mAh battery and Android Jelly Bean onboard. So when can we expect the tablet bundle, and for how much exactly? Samsung has yet to officially reveal pricing or even a release date just yet, but from the sounds of it, it will be arriving ‘soon’ to consumers in Europe. No word on if or when the bundle will make its way to North America, though we wouldn’t be too surprised if it did. AT&T dropped off a massive Black Friday and Thanksgiving weekend deal list into our inbox that includes items like a free Moto X (no MotoMaker), free HTC One, 50% off JAMBOX speakers, $30 Galaxy S4s, and half off all sorts of tablets. You’ll even find deals on things like the JBL wireless charging speaker (60% off), a Polaroid Bluetooth printer, and all sorts of cases. Some of the deals on Samsung’s Galaxy line kick off tomorrow, but most of the big stuff starts on Friday and continues on through Monday, December 2. The deals can be had both online and in AT&T stores. We have the entire list for you below, broken down by deal and date. As you can imagine, the “free” deals all require that you sign a new 2-year contract. Motorola surprised us somewhat yesterday when they announced that their ultra-affordable phone, the Moto G, was now available in the U.S. as a GSM phone. Without a contract at $179 for the 8GB model, and $199 for the 16GB model, this might be the best deal in the mobile industry. Sure, the phone doesn’t have LTE, but most HSPA+ networks are plenty fast these days, just ask Nexus 4 owners how they’ve held up over the last year. To top off its striking price, the Moto G also carries a bit of the Moto X’s customization swagger by being able to utilize swappable back plates called Shells. There are 19 options altogether through Shells, Flip Shells (like a Samsung Flip Cover), and Grip Shells. As of this morning, the Shells ($14.99) and Flip Shells ($29.99) are now available with free shipping. The Grip Shells are not yet available. If you choose to pick up a Moto G and a Shell or two, you are looking at color options that include turquoise, black, cherry, lemon lime, chalk, violet, and royal blue. Before you get too invested in the price of the Moto G, remember that Motorola is hosting a mega-sale on Cyber Monday for the Moto X with MotoMaker. You can pick up their 2013 flagship for $350 without a contract. The Moto G might be the best overall value in the industry, by that Moto X deal is the best we have seen heading into this holiday shopping weekend. Shortly after beginning to push the Android 4.3 update for the Galaxy S4 on AT&T as build 1337UCUEMJ9, issues arose causing the rollout to be stopped. Parties involved reportedly confirmed that there were issues and that they were investigating them, though no new timeline for a rollout was given. According to an update to AT&T’s Galaxy S4 support page, today is the day that 4.3 will resume, only this time as build I337UCUEMK2. To try and pull the update, head into Settings>About phone>Software update>Check for update. The update is supposed to “effective” as of today. After a bit of testing, the CyanogenMod Installer app has hit Google Play for everyone. When combined with the desktop client (and a USB cable), this becomes the fastest way to install CyanogenMod. It won’t work on every phone, but it completely automates things on supported devices. The app is basically a guide for preparing your phone to be detected and flashed by the desktop client, which does all the heavy lifting. You don’t need to be rooted or unlocked before using the installer – it’ll take care of everything for you. Since the process involves unlocking the bootloader, not all devices are supported. You can see the full list of supported phones as of now on the CyanogenMod wiki. It includes Nexus devices, of course, but also a number of recent Samsung devices and most HTC One variants. Missing are all Verizon phones (except for the Gnex), which are locked down more tightly. If you’ve got a supported device, this is a fine way to get on the custom ROM train. CyanogenMod has a pretty streamlined update system, so you won’t need to muck around in recovery mode to keep things up to date. Update: The desktop client is live on the CM website now. The saying goes “to see is to believe”, but, in some cases, “to hold is to believe” is probably more appropriate. That does seem to be the case with the Samsung Galaxy Round, which, despite the odd appearance, turned out to be quite acceptable, if not almost too plain. This hands-on comes via Engadget, who was able to snag a device indirectly from Hong Kong, since the curious-looking smartphone is available only in Korea, at least for now. 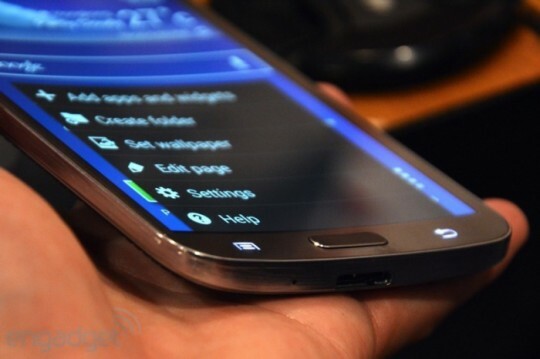 The Galaxy Round sports almost the same specs as the Galaxy Note 3 save the slightly lower battery. Also missing, of course, is the all-powerful S Pen. This makes the Galaxy Round nothing but a less capable Galaxy Note 3, whose only selling point will be it’s curved shape. The question on everyone’s mind is, of course, whether that alone will be enough to sell the device. And it’s not as if that curvature has no purpose. The folks over at DisplayMate definitely don’t think it’s a simple gimmick, arguing that the concave curve actually helps increase readability through the combined effects of reducing reflection and increasing magnification. And Engadget did seem to find the device’s curves quite a nice fit not only in their pants’ pockets but also in their hands. The curve also made swiping across the screen easier and smoother. There’s seems to be some basis to Samsung’s TV spot after all. Then, of course, there’s the Roll Effect available for quickly taking a peek at notifications, though it is unfortunate that it is the only one that takes advantage of the device’s unique shape. The Galaxy Round may have some benefits, but that will unlikely never make it across to the smartphone-using population, considering the device is reportedly not really being distributed quite extensively, making it reek of an expensive prototype. Even with the LG G Flex, it’s quite hard to tell if this is simply the beginning of a new and hopefully more innovative trend or if it is just a flash in the pan.